Die Cutters Inc - Cleen-Cut 30-inch die cutter product page | Die Cutters, Inc. 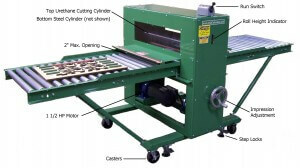 The Cleen-Cut 30” Flatbed die cutter is very simple to operate. If you click to enlarge the picture you will see a drum switch (labeled Run Switch) located on the top of the machine. Push the lever in the direction you want your die to travel, push the die into the center section and the rolls will run it through to the other side as the product cuts, then return the lever to the center of drum switch to stop the rolls. All machine safety guarding has been approved by OSHA (see OSHA letter). Setting up the Cleen-Cut 30″ is very simple. Lay the die you want to cut on one of the tables. Next, check the cutting rule height with the height indicator on the side of the die cutter, and adjust if necessary. Place a test sheet on the die and run it through the die cutter. Check the cut and adjust the cutting pressure as needed. Run another test sheet and adjust as needed. It should not take more than a couple of test sheets before you’re ready to run. If you have a question about something you want to cut please call us, we are more than happy to help you. The Cleen-Cut 30″ will run on a 120V, 20-amp circuit. 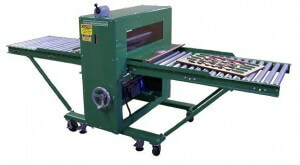 It is built on swivel casters to make it portable; you can move it out of your way when you’re not using it. There are step-on floor locks to hold it in place when you are running it. The Cleen-Cut 30″ Flatbed die cutter is just what you need to get your orders done on time.